Now you can convert your PowerPoint presentations (PPTs) to AVI or full high-definition (HD) 1080p HD-AVI format without Microsoft PowerPoint. Xilisoft PowerPoint to AVI Converter offers the quickest and the easiest way to convert all of your PPTs to AVI or HD-AVI format allowing you to view PPTs on multimedia player capable of playing AVI or HD-AVI video. In addition, Xilisoft PowerPoint to AVI Converter lets you edit your PPTs in various ways prior to conversion: rehearse and add your own commentary and background music, attach watermarks, adjust the slide transition interval or remove all the original slide features. 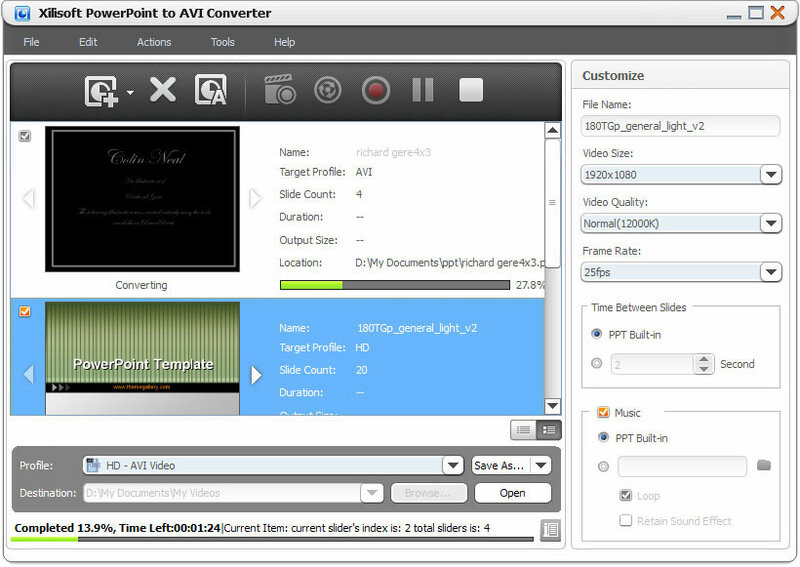 This PowerPoint to AVI converter also allows you to adjust a variety of conversion parameters to create custom PPTs. Convert PPT to AVI format videos for playback on any multimedia player compatible with AVI. Convert PPTs to HD-AVI format videos for playback on HD-AVI compatible HD players. Rehearse then record your own commentary, add background music to your PPT before making it into an AVI video presentation. Attach a trademark to your presentation to mark it as your own and prevent it from illegal distribution or use. Set the interval between slide transitions; adjust the frame rate, video quality, resolution and many other parameters to customize your AVI video output. Convert PPT with original slide features such as animations, sound and effects removed at the highest speed possible with the "Express Convert" feature. High Efficiency, High Compatibility, High Ease-of-Use! Save time by converting several PPTs to video presentations in one go with exceptional speed. Fully compatible with all Microsoft PowerPoint file types: ppt, pptx, pptm, ppsx, pps, ppsm, potx, potm, pot.